A measure of the talent and ability of the amazing Clas Thunberg is that he won five speed skating medals at the inaugural Winter Olympics in 1924 at Chamonix (including three gold medals), despite being over 30. Had the Games been introduced earlier, his list of titles would unquestionably have been even longer but just one of his many distinctions is that he stands alone as the oldest speed skating champion in Olympic history with his brace of golds at the 1928 Games at the age of 34. Finnish speed skaters Clas Thunberg (R) and Julius Skutnabb pose during a break in practice at the Winter Olympic Games in Chamonix in 1924. Thunberg won gold medals in the 1500m and 5000m, a silver medal in the 10.000m, and a bronze in the 500m. 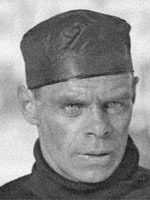 Thunberg's nickname was "the Nurmi of the ice" after his legendary compatriot and Summer Olympics star Paavo Nurmi, with whom he shared the passion for training all year round. Despite his credentials as a long-distance specialist, Thunberg began superbly at the 1924 Winter Games at Chamonix with a bronze in the 500 metres, speeding in behind the surprising American Charles Jewtraw and the Norwegian Oskar Olsen. In his more favoured 1500 metres discipline he struck gold, and was again unstoppable in the 5000 metres, which he won by more than nine seconds from his compatriot Julius Skutnabb. Legend has it that he sacrificed victory in the 10,000 metre race to allow his teammate Skutnabb to win, already safe in the knowledge he had still done enough to win the all-around title, a medal awarded on just that one occasion at Olympic level. Four years later at St. Moritz he won his fourth and fifth gold medals and he will go down as a one of the greatest short distance skaters despite an all-around ability that sometimes let him down in the longer races. Thunberg, by then aged 34, finished joint first in the 500 metres with Norway's Bernt Evensen before powering his way to victory in the 1500 metre race ahead of Evensen and Ivar Ballangrud. Unhappy with the organisers at the Lake Placid Games in 1932 after their decision to hold mass starts instead of the two-man heats, Thunberg refused to compete, and with four world records under his belt, finally retired at the age of 40. He loved to live hard and was a notorious party reveller who enjoyed a drink and smoked his fair share of cigarettes in his earlier days before settling down to concentrate on sport. He died in April 1973 at the age of 80.